What’s the most popular anti-anxiety drug at the moment? The trend is to use a whole bunch of existing drugs “off-label,” which means to treat conditions that they’re not approved for by the FDA. We’re using anticonvulsants like Neurontin and Gabitril for anxiety. Seroquel, which works on schizophrenia and manic depression, also seems to control anxiety and stabilize sleep patterns in low doses. There was a study in which one group of dental-phobic patients were given Geodon, an anti-psychotic, and another group was given Valium before a dental visit. 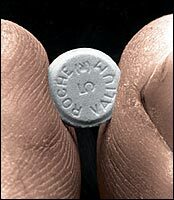 Geodon was just as effective as Valium, but without the sedative effect. Does that mean Valium is on the way out? Every high-strung New Yorker has a little supply of Xanax, Valium, or Ativan at home, but we’re definitely seeing inroads from the newer meds. The FDA has even approved antidepressant SSRIs (selective serotonin reuptake inhibitors), like Lexapro and Paxil, and SNRIs (serotonin and norepinephrine reuptake inhibitors), like Effexor, to treat anxiety. We’re taking another look at BuSpar, which got a bad rap—I think it just wasn’t used properly. What will we use five years from now? The chemical cousin to Neurontin, Pregabalin, is an anticonvulsant that’s in trials. It’s also being looked at for social-phobia anxiety disorders. There’s another type of drug in development that works on regulating the pathway of the stress hormone cortisol directly. But that’s down the line. What do you think about “non-prescribed” remedies?